Treganoon Round Barn is one of our newer properties, situated just outside St Austell, near Lanlivery. As the name suggests the lounge and master double have partly round rooms, sleeping a total of 6 people. Rosevean sleeping 7 on the edge of Bodmin Moor is a wonderful modern property perfect for exploring the area. The Tractor Shed in the centre of Bodmin is another of our newer properties but proving to be very popular for families of four. In Falmouth The Sea House offers superb waterside accommodation for up to four people over the age of 16. With parking and within walking distance of the town, this is the ideal place to stay for getting away from it all but still requiring lots of facilities on the doorstep. The Old Stables is a fascinating Grade II luxury modern conversion set in Mid Cornwall. Sleeping up to 10 people, perfect for a big family get together or groups of friends who just don't see each other very often. In St Mawes, the most popular of all the villages on the Roseland we have Bosun's Lockersleeping two tucked away in a wonderfully quiet spot just off the sea front. 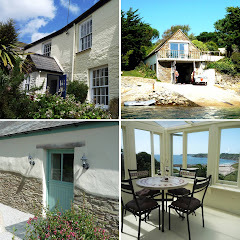 The River House sleeps 6 people with stunning sea views, in a reverse level house. Tantallon in St Just in Roseland offers great accommodation for seven people with views of the River Fal across to Mylor. In Portscatho, a smaller well stocked village, Hillside Cottage right in the centre of the village sleeps 5 people. Harbour Court, perfect for a couple looking to get away for the week. Merrose Barn on the outskirts of the village at Trewithian is a wonderful base for a family of four looking to explore. Vineyard Cottage is an immaculate reverse level one bedroom property set in rolling country near Treworga. Ardevora Vean offers a couple a relaxing holiday set behind Philleigh, with nearby farm land and estuaries to explore. In Tregony Coopers Cottage is ideally placed for exploration of Mid to East Cornwall. Especially The Eden Project and The Lost Gardens of Heligan.